Allison and I have the privilege of leading a college small group for our church, and it has been on hiatus this summer. I won’t lie to you, I miss our friends. As they all finish moving back for the next semester and some new students join our group, I have been processing last year and everything that happened. 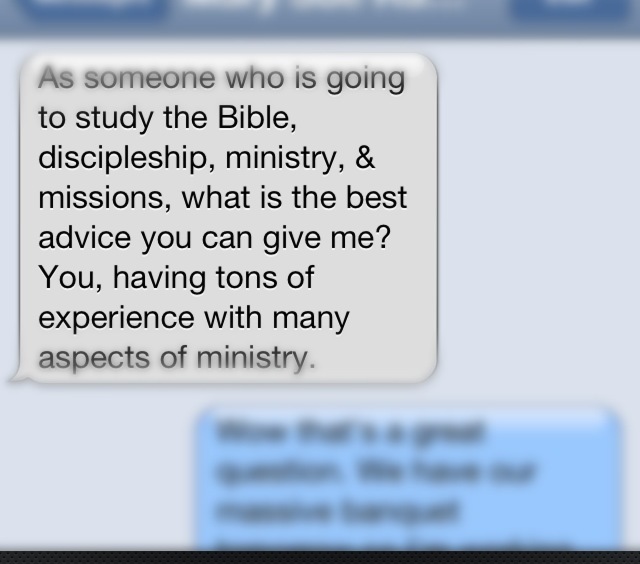 First of all, let’s all laugh at the phrase “you, having tons of experience with many aspects of ministry.” “Tons” might be a little too polite, but hey, maybe they were buttering me up to answer their question. The more I thought about it, the more I realized I have been in some sort of “professional” ministry for more than 10 years. Yikes. Anyway, what a great question, what a wise question. So if there is any encouragement in Christ, any comfort from love, any participation in the Spirit, any affection and sympathy, 2 complete my joy by being of the same mind, having the same love, being in full accord and of one mind. 3 Do nothing from selfish ambition or conceit, but in humility count others more significant than yourselves. 4 Let each of you look not only to his own interests, but also to the interests of others. 5 Have this mind among yourselves, which is yours in Christ Jesus, 6 who, though he was in the form of God, did not count equality with God a thing to be grasped, 7 but emptied himself, by taking the form of a servant, being born in the likeness of men. 8 And being found in human form, he humbled himself by becoming obedient to the point of death, even death on a cross. 9 Therefore God has highly exalted him and bestowed on him the name that is above every name, 10 so that at the name of Jesus every knee should bow, in heaven and on earth and under the earth, 11 and every tongue confess that Jesus Christ is Lord, to the glory of God the Father. So there it is, my best advice. Live out Phil. 2. As we enter our communities, in the same way as Jesus, live out the love, the joy, the sacrifice, the service, and the humility he demonstrated – all for the glory of God the Father. What about you? What do you think of Phil. 2? What do you wish someone had told you at the beginning? What is your best advice?